Made of lightweight, durable materials AirFit F10 Mask feels lighter on the face, and is less susceptible to leaks, than more traditional full face masks. With a sleek frame and compact cushion the AirFit F10 minimizes facial contact, providing stability and an unrestricted field of vision without a forehead support. AirFit F10's curved frame arms are made of soft, clear silicone that hovers just above the cheeks or rests gently on them. Soft fabric sleeves are included as an optional comfort accessory for those who prefer the feel of fabric to silicone. 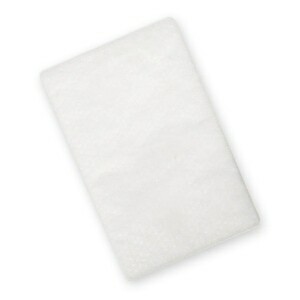 AirFit F10's Spring Air cushion has a lightly textured surface that feels more natural on the skin and improves seal. 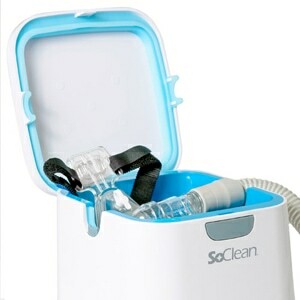 The dual-wall design gently inflates during therapy to create a soft, adaptable pocket of air between the mask the face. Updates at the nasal bridge reduce pressure and leaks. 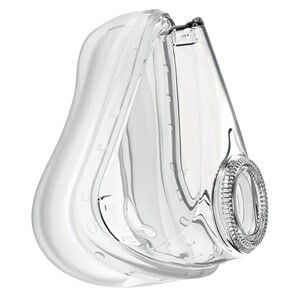 Mask packs are available with three cushion sizes -- Small, Medium or Large -- to fit a wide range of users. Extra Small cushions are also available as a separate item for user with smaller faces. AirFit F10's SoftEdge Headgear has slim straps made of premium, rolled-edge fabric so it is comfortable to wear and reduces facial marking. SoftEdge headgear should be worn loosely to allow the mask cushion to inflate and adapt to facial contours and movement through the night without pressure, pinching or creasing. 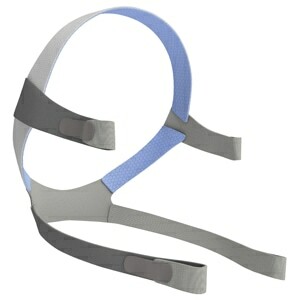 All AirFit F10 Mask Packs include adjustable Standard SoftEdge Headgear, in gray with blue highlights. Small headgear is available separately for users with smaller faces. The AirFit F10 features a one-piece elbow with quick release squeeze-tabs so it's easy to detach with one hand at night. The elbow rotates 360° and includes an independent tube swivel to reduce tubing drag. Advanced venting, around the elbow, delivers an ultra quiet performance. Air is dispersed gently away from the user and bed partners so everyone can enjoy a quiet, comfortable night's sleep. The AirFit F10's user friendly design is easy to fit and easy to maintain. It has just four parts -- elbow, frame, cushion, and headgear -- so there's no need to worry about losing bits or breaking clips. Headgear Loops on the frame frame make it easy to detach and reattach the headgear without constant adjustments. The cushion attaches to the frame with a simple click and removes with a squeeze. What could be more simple! 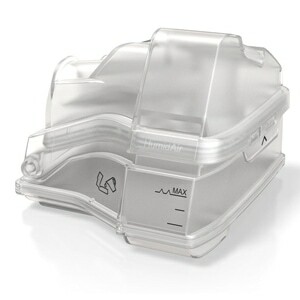 In the Package AirFit F10 Full Face CPAP & BiLevel Mask with Headgear and Soft Strap Wraps. The F10 AirFit's finely went on sale for $100.00 and I purchased two of them. I with the mask arms on the frames were more robust. I am very satisfied. Great choice. This mask was comfortable- but not quite right for me. It seemed a little small in size and I had a sore nose. So I have sent it back. But isn't Direct Home Medical great that you don't have to keep these expensive masks when they aren't right for you? I was using F&P Flexifit 431 before getting this mask. I like how light it feels on my face compared to other "gel" type masks. You have to understand that this mask was designed to be a minimalist design. It's smaller and lighter than other masks that I have used before. Do not expect this mask to help you keep you mouth closed - that's what chin straps are for. This is a pretty fair fit for me. Probably my 2nd choice for fit and comfort. Make sure to get the right size. The mask has a soft but definitive feel. Plenty of comfort compared to other masks. The mask does nothing to assist in keeping your mouth closed. This mask suffers from the common problem I have with all hard plastic shells. The bridge of my nose gets rubbed raw overnight no matter how loose I make the head gear. Hans Rudolph and the Sleep weaver don't. The hybrids don't either but have other comfort issues for me. I think it has to do with sleeping on my side.